India clinched the one-day international series in Pallekele on Sunday but the win was marred by an incident involving the spectators. With India needing eight runs from six overs, fans threw bottles on to the field, halting the game for 35 minutes. 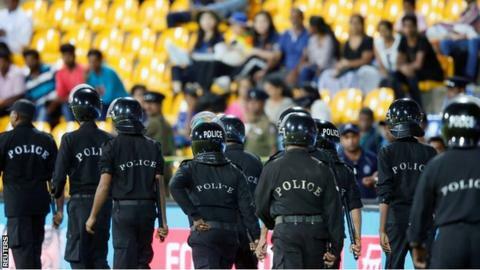 An additional 1,000 police will now be deployed at the stadium in Colombo. A police statement also said that CCTV cameras will be used to "monitor the crowds" at the 35,000 capacity R Premadasa Stadium on Thursday. "Any spectator who throws any bottles or projectiles at the players will be immediately arrested," the statement read. The Sri Lanka selection panel also stepped down en masse on Tuesday after the home series defeat. "The heartbreaking incidents of unruly behaviour we witnessed at Pallekele last Sunday were the last straw for us," they said in a statement. The series now returns to Colombo for the last two ODIs (31 August and 3 September) and a Twenty20 international (6 September).